The Goldenrod CD, released at the end of 2004, received radio play in 2005 all over the country from Alaska to Maine to Florida. Lise donated the proceeds of her Renaissance CD, “Wing’d With Hopes” to the Red Cross Disaster Relief Fund through CD Baby from September 3, 2005 – October 25, 2005 . All in all, CD Baby collected a total of $165,060 from artist sales to give to the Red Cross Disaster Relief Fund and donated $40,000 of their own company money for a grand total of $205,060 donated. Lise performed concerts with Saratoga Faire at the Dance Flurry Festival in Saratoga Springs, NY; Nassau Free Library in Nassau, NY; The Maple Festival in Cobleskill, NY; Irish 2000 Festival in Altamont, NY; and the Inlet Fall Festival in Inlet, NY. Lise also performed with the Spirites Consort at The Killington Renaissance Faire (blog and photos posted here) as well as The Dance Flurry Festival. She also did a number of concerts with Jim Lestrange (as a duo) including Kribstock and The Victorian Streetwalk in Saratoga Springs , NY. Lise was part of some group exhibits which included “The Portal”, featuring doorways and openings, in February at The Small Gallery in Cambridge, NY; a member exhibit in February and March at LARAC’s Lapham Gallery in Glens Falls, NY; and juried Christmas shows at Mohawk Valley Center for the Arts in Little Falls, NY, LARAC’s Lapham Gallery in Glens Falls, NY, Fulton Street Gallery in Troy, NY and Valley Artisan’s Member Show in The Small Gallery, Cambridge, NY. Lise's art was exhibited at Westside Gallery on Beekman Street in Saratoga Springs, NY from September 2005 until April 2006. Beekman Artisans, a co-operative gallery, where Lise was a member from 2004 - 2005, closed its doors in Winter of 2005 and was taken over by one of its members, Michelle Lalonde, who turned it into a gallery of wearable art and art for the home called Mimosa. The new year comes to us with one of the largest tragedies I can think of in my lifetime, the Tsunami wave of the Indian Ocean. At the same time and in a different place, Susan Sontag, the writer, died. I met Susan Sontag once. At the time she had seemed larger than life to me, having lived through cancer and possessing an intellect and awareness that seemed extremely heightened, refined and defying predictability. She stood out amongst a crowd of other well known intellectuals and writers. Perhaps it is because what she said always rang more true to me than what her peers were saying. She also seemed to have an air of old-world composure; a trait that I automatically assumed had come from a lengthy struggle with death where what really matters comes to the center of one’s attention. At the time I met her, I was reading her books. This was pure coincidence since it did not seem possible or predictable that I would ever be in her company. I was young then and wanted to be a writer myself. The path seemed clear at that point in my life. Then it derailed, for lack of a better term, and went off in all kinds of other directions. My path has seemed somewhat ambiguous, but I continue to meet writers as well as musicians and visual artists who have an impact on me. Lately, I have been thinking about my father’s path which was much more straight-forward than mine. His way of looking at our country has definitely influenced me, especially lately. This last December, he celebrated his eightieth birthday. He was, for most of his life, an architect, an activist in city planning, and an advocate of cities which had a preference for pedestrians. He believed in sensible buildings which are beautiful to look at and complement existing residential neighborhoods and local plant life. I noticed, especially last time I saw him, that he did not feel so compelled to save the country any more in this manner, and rightly so, since present trends have gone in the opposite direction for years with corporate power behind it, making it even more of a formidable challenge than in earlier years. This period in his life seems more to be about rest and reflection, maintaining small gardens and talking with his family. His last project was about trying to get his city to think about a parking garage underground where it would not get in the way visually and disturb the outdoor activities, fairs and other assorted events that the designated place had provided for decades. He succeeded mostly, with some compromises and a hellish uphill battle. Now that he is finished with that work, his life’s spotlight and direction bears heavily upon my mind. I feel as though I have taken it for granted my whole life. It is with the knowledge that he can no longer be a forceful voice that I have stood behind Kunstler’s work in this subject matter, which has a similar message. On that note, one of the most enjoyable aspects of the Saratoga Victorian Streetwalk, which Jim Lestrange and I played this last December, was the fact that the main street running through the downtown was closed off. Besides seeing a lot of people dressed in Victorian attire and a few horse and carriages on the streets, it seemed to transport everyone back to another time. The noises were (with the exception of horses clopping) all people noises: laughter, talking, singing and dancing. It was like one of those scenes that L.L. Bean put on one of their Christmas catalogues, a take-off on Grandma Moses showing young and old out and about in a snow-covered New England town (with horses and carriages in the streets) and not an automobile in sight. Over the holidays, we took a trip with my father to Deerfield, Massachusetts. I have wondered what kind of American model we might look to in this country which is not gas dependent, and which is friendly to earth, local talent, local manufacturing, close to commerce, has sensible architecture, is green and lush and nice to look at. It is found in Deerfield , a town built in the 1600s and 1700s, which in its time took into consideration a human need for city, town, community and commerce, and also a need of country, nature, and quiet, a place to grow things and keep animals. The town’s people of the era put all of that together nicely when they built Deerfield . Everything one might have needed was probably within walking distance. As in an ordinary suburban design, the houses are set apart with green lawns in front, but they all face each other like they do in a city with a common “street” between them, while in the back of the houses are individual farms with land that stretches all the way to rising hills, complete with beautiful “views”. The valley in which the town sits is very fertile ground for growing food. It is so obvious that people of that era knew how to live, especially in regards to land development and designing a town. I think one of the reasons why Renaissance faires are becoming more and more popular is a yearning for a simpler time, a time without motors, traffic jams, cell phones, computers, claustrophobic and oppressive living quarters, malls and strips and parking lots. Since we are performers at Renaissance faires (which happened by default, really, since we decided to play the music based on our love of it and not because we were thinking of marketability), it has given me a chance to ruminate about why going back to another era, even if just by vague approximation, is so seductive. It seems to me that the biggest reason is because human beings have been living with natural sounds, acoustic instruments, hand-made items, traditions, face-to-face contact and a relatively noiseless, earth-friendly mode of travel for millions of years and the present American scene doesn’t allow for much of this. The motivations for going to a faire may be somewhat similar as going to Deerfield or to a European castle in that some of what you go away with is the thought that people of earlier times maybe got some things right. Perhaps, in the end, it gives us enough of a transcendental experience that we are inspired to change some of how we live, before we are all at war over the last dwindling oil supplies, drowning in skyscrapers, asphalt, tech and roaring motors (or more likely, motors that won’t work). I think it is significant that Owain Phyfe left an automotive business to play at Renaissance faires and make Renaissance music. I have been trying to re-establish old connections and reach out to new ones in the music world since “The Goldenrod” came out after a long hiatus last Winter and Spring while I was ill.
One of the people I reconnected with is Lisa Lynne (Celtic harpist and recording artist with Windham Hill, New Earth Records and her own label, Lavender Sky) who reached out to me last year. We were on the same radio program together, back to back (and we do have names that rhyme after all) and we traded CDs and e-mailed back and forth a bit. Anyway, I was very happy to finally network in a genre of music that so few artists belong to at this point, but has signs of growing little by little (I am talking about “new twists on Renaissance music” as a genre). Again, there aren’t too many of us out there, and the struggle is not always easy because it is such a new market, not always accepted, and for that reason it can get to be a lonely trail. I played Lisa’s music a lot during the time I was ill (while also creating a lot of visual art with a spiritual message to stay positive). It all went together in creating a time that was affirmative and constructive and I can’t say enough good things about her CDs, particularly her “Maiden’s Prayer” album. For a CD that came from a chance encounter, it has become one of my favorites. Besides the fact that the CD has very creative and beautiful ways of interpreting and reinventing olde music, the musicianship is stellar. The engineering, by Gil Morales, took my breath away when I first heard it. He just had those instruments EQd, fading in and out and sitting in the mix in just the right proportions. I wonder how much he slaved over this. It really is one of the best engineered albums I’ve ever heard in my life and I have heard an awful lot of albums. One of my newest contacts was Douglys and Bella of “Howl-O”. I kept seeing their names pop up in various places. We’re featured in a lot of the same websites. They play a lot of Renaissance faires in the Midwest and I’m hoping some day to meet them on the circuit. So, this closed door approach to creative music (i.e. not easily defined by category) is happening on all levels even with people with national recognition. Thank you, Candice, for telling it like it is! It is here I’d like to say that we (the Spirites Consort) were often told at venues which featured mostly folk music, that we sounded too classical and at venues which featured mostly classical music, that we sounded too folk. Needless to say, we had a difficult time in getting our music to an audience unless we were hired because of a market-recognizable demo (i.e. not revealing crossover) and “slipped it in the backdoor” so to speak. From someone who has spent a lot of time in the visual art world where anything goes, this attitude just seems so uptight and geeky. It does seem to me that the audience should be the judge and we have had good luck with audience responses. 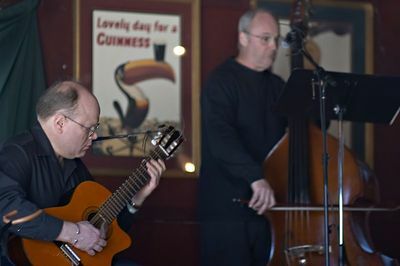 Does it ever occur to anyone who runs a concert series or a radio program that audiences might want to hear something different than the same tired old re-makes? When I started performing the music featured on “Wing’d With Hopes”, in the mid nineties, Blackmore’s Night wasn’t around yet and I hadn’t heard of Owain Phyfe (as referenced earlier). But thank goodness that Blackmore’s Night is around and that they are blazing a trail for the rest of us. It would take performers with a lot of name recognition and conviction in what they are doing to blaze a trail that the music world can’t figure out what to do with except to be worried about whether it is too folk or too classical. This cute little barn is my new pottery/art studio. 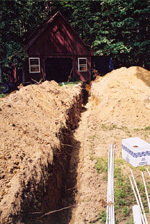 The barn/workshop didn’t have any water (needed for wheel-thrown pottery), so a ditch had to be dug. You can see that this is a major undertaking. My sweetie did most of the work himself, planning the whole thing out, laying down the pipe and filling the ditch back in again. Needless to say, I am very happy to have my own studio after nearly 16 years in various co-operative studios. It was another wonderful weekend at the Dance Flurry Festival. The founder of the Flurry, Paul Rosenburg, who seems like the father, protector and promoter of traditional music and local acoustic musicians, decided to step down as administrator. Hopefully the festival can continue with the same care and positive energy that Paul has given 18 years of his life to it. What an incredible achievement! I don’t believe there is a festival in the country quite like it. Both the bands I play in, The Spirites Consort and Saratoga Faire, were hired for this year’s event. Between our performances, Jim Lestrange and I roamed around to other events, most notably to jam sessions and to see the Bells and Motley Consort (where I purchased one of their CDs), The Whippersnappers, Allan Thompson’s Big Band and Captain Squeeze and the Zydeco Moshers (lots of different styles, that’s for sure!). We also attended The English Country Dance Farewell Party with Mary Lea and Friends (we both came to tears over their “Raif’s Waltz” and then found the author/interpreter dancing on the floor afterwards!). We also attended the last hour of the Contradance Farewell Party and heard a stunning version of “County Down” in ¾ time, sung by John Kirk with a full orchestra behind him, violins all harmonizing with each other. Staying at our house for the duration was Binghamton hammered dulcimer artist extraordinaire, Curt Osgood. 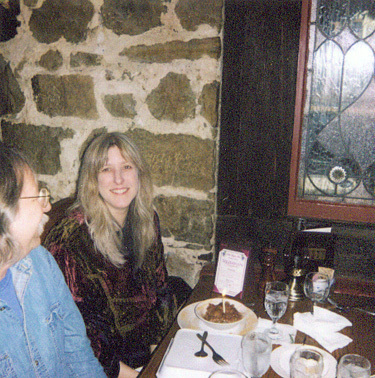 Some photos of my November 2004 exhibit “Angel Inklings” at The Small Gallery in Cambridge , NY were developed recently (photos by Jim Lestrange of Saratoga Faire). If you weren’t able to attend, you can click here to get a glimpse. 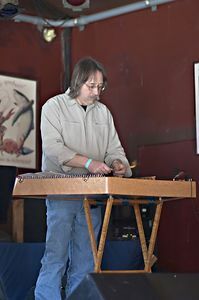 While we (the Spirites Consort) were at the Killington Renaissance Faire, our hammered dulcimer player ran around on his breaks taking photographs. Shannon Dancy also took some photographs with Jim’s camera of our band during a performance. I also contributed my own write-up about some of the experiences we had there. Click here to view.